Posted in challenge, Love Is In the Air, Mainstream Polish, Manicures, Nail Art, pictures	by Jessica W.
Good morning everyone! Ever since I saw the outfit that Kerry Washington was wearing over on Makeup by Kim Porter’s Facebook page, I just knew I had to recreate it, and what a better time than today’s prompt? I started off with 3 coats of Wet N Wild’s A Blank Canvas on on my fingers. 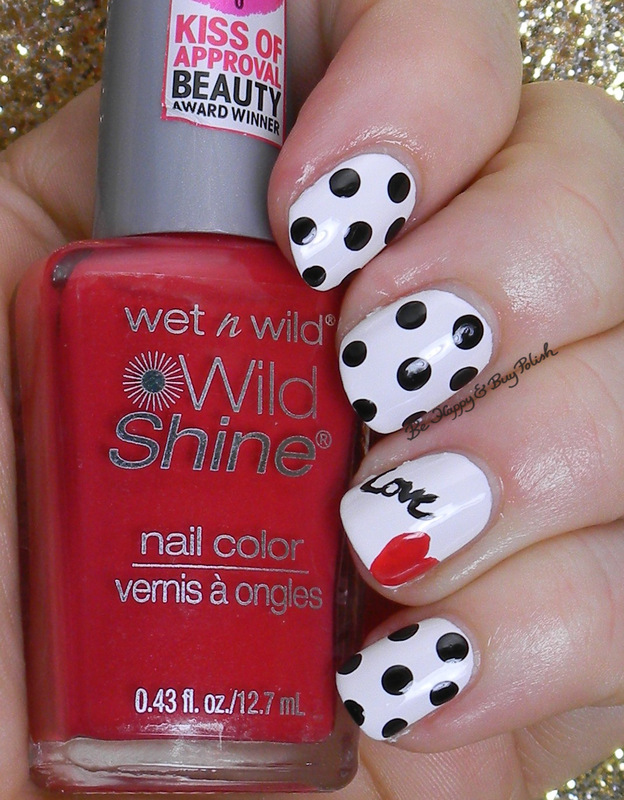 I used WnW Black Creme for the dots and letters and Red Red for the heart. I absolutely love how this turned out and I hated taking it off. Plus, this is fairly simple to do if you have a larger dotting tool and a thin nail art brush. Heck, you could even skip the lettering and just do hearts! What do you think of this look? Too simple for you, or just right? Are you kidding?! This is seriously one of the very cutest manis ever! How on earth are you able to make your dots so perfectly round?! You are so skilled! This is super cute Jessica! Great job! I’m totally jealous of your nail writing! This is really lovely, Jessica. 🙂 I really need to work on my lettering skills. I love the simplicity of the black dots over white. Now if only I could write on my own nails without it looking like a 2 year old did it lol. Beautiful mani! Cute mani!! I would totally recreate this. Maybe next year I can. I really like it. Great job! This is so sweet! Love the accent! Love it! A nice change from the usual pink and red Valentine’s manis. This is so cute! Love the black and white and touch of red! These are adorable!! Your polka dots turned out awesome! So cute & perfect for Valentine’s Day! So pretty! I love the design for the accent nail! I instantly knew what your inspiration was! Love your nail art, simple and classy! Your dotting is perfect! Love the accent nail! Simple and cute, I love it! Dotticures are my obsession lately. I couldn’t love these more if I tried!! This nail art is GORGEOUS!